Taking a sip of coffee from my Kate Spade mug, I glance at the phrase glazed across the outside. “Eat cake for breakfast” it reads. For the entire time I’ve owned this mug, I’ve always thought it was just a colorful little phrase. That is, until, I discovered In A Pickle Restaurant in Waltham, Massachusetts. Of course I’ve eaten birthday cake for breakfast at least once in my life but the extreme pancakes at In A Pickle are different. 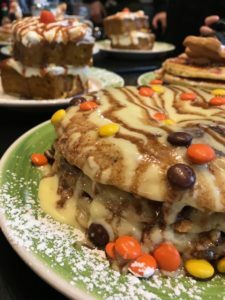 Breaking the barrier of socially acceptable breakfast (pancakes) and the less acceptable (birthday cake), stacks like cookie dough, reeses, and M&M pancakes are staples in the regular rotation. 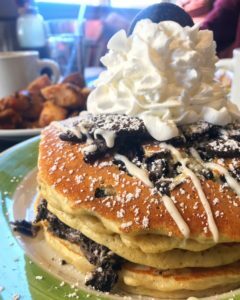 But it’s the weekly specials, that explain why TV stations and Food Bloggers alike flock to the bright green diner in Waltham. When I say extreme, I mean three stacks of pancakes layered with reeses pieces and stuffed with melted chocolate ganache filling. I mean the dunk-a-roo frosting we savored as kids, layered between fluffy cakes with a giant cookie on top. I mean oreo filled pancakes, with even more oreos in between. Cannoli, funfetti, smores, and fruity pebbles are just a few examples of the featured cakes that grace the tables (and Instagram feeds) of many. 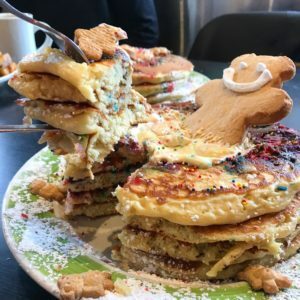 The pancakes are stunning as they arrive at your table, and although I never anticipated taking a breakfast food like pancakes home for leftovers, it’s nearly impossible to get through an entire plate, and to my surprise they still taste great the next morning. Whether these pancakes can truly be considered breakfast food may be up for debate, but as it seems from my experience so far, the more outrageous the better at In A Pickle. P.S. Be sure to follow along on Instagram!